Today we are pleased to release MuseScore 3.0.5. The focus of this release was performance and stability. We reached an incredible boost in optimization so MuseScore 3 is now faster than MuseScore 2, but is still powerful with the smart layout feature. The crash reporter facility introduced in MuseScore 3.0.3 lets us concentrate on fixing the most frequent crashes. MuseScore 3.0.5 introduces the patch for the crash on startup on macOS, which was reported dozens of times. This update fixes dozens of issues as well as adding a few improvements. Our goal is to optimize the editor so that it becomes possible to work with the scores like Brandenburg Concerto No. 3 on at least the machines with the specs like Atom Z3740 1.33GHz CPU (1062 scores), 2Gb RAM, Windows 8 32-bit. The most complicated score we work with (and ever saw) is The Planets. We want to achieve comfortable work with such scores on the machines like i5-3210M (3826 scores), 8Gb RAM. If you have already installed any version of MuseScore 3 series, you should be automatically offered the opportunity to update the next time you start MuseScore. You can also update at any time by going to Help > Check for Update. Note: this post does not show as "News" on the main page, and neither did the 3.0.2 announcement. Yes, it was fixed shortly after my post (whether the two are correlated, I don't know). 3.0.2 still doesn't show up in the news archive though. In case the issue is not fully understood I have attached an example. The cursor can not reach the bottom of the mixer panel in order to make it smaller. Using: OS: Windows 10 (10.0), Arch. : x86_64, MuseScore version (64-bit): 3.0.5.5992, revision: 58dd23d. Device: Asus ZenBook UX430UA-GV535T (14" screen). Scaling 150%. Also the size of the Play Panel is absurd (large), but at least it is possible to reduce its size to what one wants. The scaling indeed could become an issues sometimes when one deals with Qt based application. Btw, try to reduce height of the Mixer by collapsing the top controls pressing the "arrow" bar (see the attached picture). After that, you will be able to shorten the Mixer using top edge of the widget. Indeed after collapsing, one a able to manipulate the mixer smaller, so that the bottom can be seen. After expanding the whole process has to start again. Scaling to 100% is not useful as I can not read the screen anymore.. It is not clear to me which Operating System you are using. I use Ubuntu Studio 18.04.2 LTS (64 bit Linux), and this issue, probably, is present with some "Window Style" (from the "Ubuntu Configuration Manager"). Whatever, in that panel, you can go to the "Appearance" tab, subtab "Kind of Characters", and there you can change the PPP value (the visual size of a lot of things into the screen). This will help you. I don't work with WIndows or Mac, but I guess there should be some control about PPP, somewhere into the "Windows Control Panel". copied my environment from above: Using: OS: Windows 10 (10.0), Arch. : x86_64, MuseScore version (64-bit): 3.0.5.5992, revision: 58dd23d. Device: Asus ZenBook UX430UA-GV535T (14" screen). Scaling 150%. I have the same issue with the Style menu, e.g. the header and footer screen : unable to reach the bottom of the screen. I didn't have this issue in version 2. I'd love to go back to that version but then can't use files saved in version 3. "copied my environment from above: Using: OS: Windows 10 (10.0), Arch. : x86_64, MuseScore version (64-bit): 3.0.5.5992, revision: 58dd23d. Device: Asus ZenBook UX430UA-GV535T (14" screen). Scaling 150%." With Windows10, have you tried with a custom scale, for example, 145%? To do this, right-click on your computer screen -> Display settings -> Scaling and layout -> click (option written in blue): "Advanced scaling settings." You arrive in another window (image below). I have tried a scaling of 149%, and to my surprise it works!!! Of course no noticeable difference in visibility. Thanks a million ! K no offence but I like reeeeeally hate musescore three. The new automatic positioning of lyrics and stuff doesn't work well when I want to skip to a certain part of my score and press play, it glitches, and I hear this annoying noise whenever I put a note down. On a mac if you were wondering. Dunno if that makes a difference. Bottom line: with a little work, this is gonna be booooomb, but for right now, im sticking to musescore 3. Speaking of which, does anyone know how to convert musescore 3 files to musescore 2 files? You have to export the file to musicxml which can be opened in version 2. If you have a score that is not playing back correctly, please start a new thread and attach it. Also please start a new thread and attach the score for which autoplace of lyrics is not working correctly. We want to fix problems but need people to report them with enough details to allows us to can investigate. 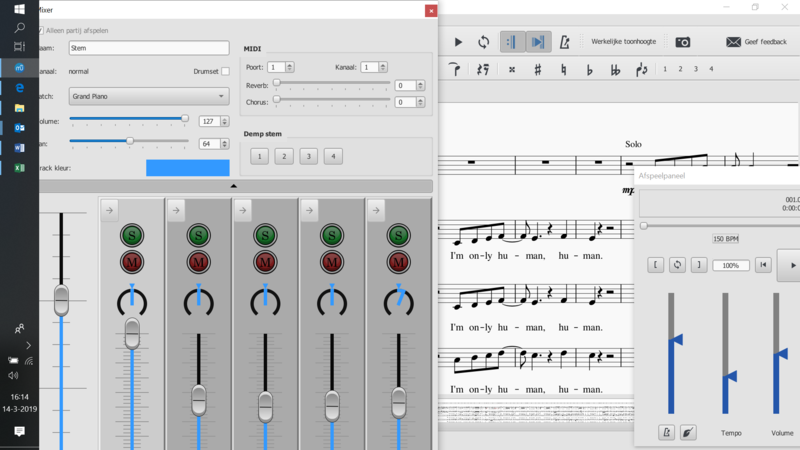 Do you have musescore 3.0.5 for linux mint 32 bit as well? I have tried both 3.04 and 3.05 but one longer score (circa 700 bars) I am working on has problems.... It works fine in 2.3.2, but on version 3.x it will only play the first hundred bars or so and then refuses to play any further. The piece only uses 5 parts.... I am still working on it, but obviously, if you cannot work beyond a certain point in a score it is a bit of an issue! I will continue using 2.3.2 for now. You would need to start a new topic and attach your score to know why this is happening. It's possible there is a bug that needs fixed, so please do this.